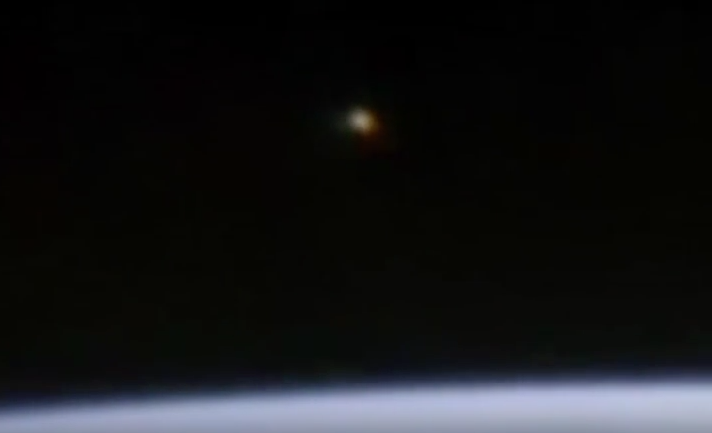 UFO SIGHTINGS DAILY: UFO Sighting with Orange Lights above Earth's Surface (ISS) Oct 17, 2015, Video, UFO Sighting News. UFO Sighting with Orange Lights above Earth's Surface (ISS) Oct 17, 2015, Video, UFO Sighting News. This spectacular UFO was caught near the ISS on Oct 17 and is a golden orb. I have caught a similar golden orb that was actually flying so close to the space station it was just meters away on live cam. (click here to view). This UFO is very amazing and seems to appear out of nowhere. Great catch by Finding UFO of Youtube.